(September 4, 2016) Last week the North Carolina Department of Transportation (NCDOT) released its list of Regional Impact projects recommended for funding through its Prioritization 4.0 process, and it included the widening of Highway 160 (Steele Creek Road) between Highway 49 (South Tryon Street) to the South Carolina state line with construction beginning in 2022. As shown on the list available HERE, this project scored next to last on the list of funded projects in Division 10. 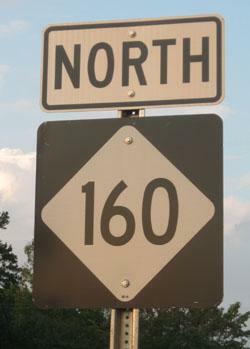 Although the project was on the bubble, the local NCDOT staff promoted its inclusion to state officials, and it was placed on the same schedule as the widening of Highway 160 north of Highway 49. This project is second on the list when sorted by recommended start dates. Funding for widening Highway 160 from Shopton Road West to Highway 49 was approved in the 2016-2025 State Transportation Improvement Program. Right-of-way acquisition is scheduled for 2020 with construction in 2022 and 2023. 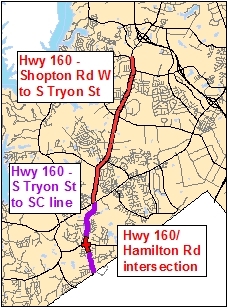 NCDOT is recommending that the widening of Highway 160 south of Highway 49 be on the same schedule so that the entire widening from Shopton Road West to the South Carolina state line can be completed together under the same contracts. NCDOT will release its Draft 2018-2027 STIP in January 2017, and it should be approved in June. Any projects scheduled to begin within the first five years of the STIP are considered safe and not subject to reprioritization. The widening project will include two lanes each way with a grassy median, turn lanes, bicycle lanes, and sidewalks. Also included in the 2016-2025 STIP is a project to improve the intersection of Highway 160 and Hamilton Road, which will "widen intersection for additional capacity and future Steele Creek Road cross section." The schedule shows right-of-way acquisition in 2018 and construction in 2019, but planning is already underway, and NCDOT staff have said that construction could begin in 2017. 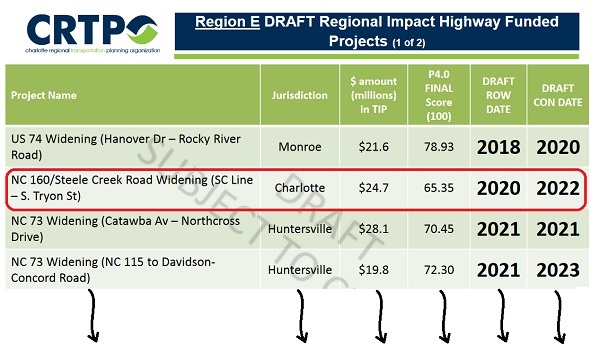 The widening of the southern section of Highway 160 did not qualify for inclusion in the 2016-2025 STIP, but it has moved up in priority in the latest round of reviews, This improvement certainly has been influenced by the support given by the community in comments to NCDOT and the Charlotte Regional Transportation Planning Organization (CRTPO) as well as at the annual Steele Creek Residents Association meetings. You, the Steele Creek community, have made a difference! At the Steele Creek Residents Association meeting in 2013 Bob Cook of CRTPO said that no Highway 160 project was included in long term transportation plans that identified projects expected to be constructed by 2035. Beginning with the 2040 Metropolitan Transportation Plan, adopted in April 2014, Highway 160 projects have been slowly moving up on priority lists, so a projected 2022 construction after three and a half years of planning is a significant improvement.